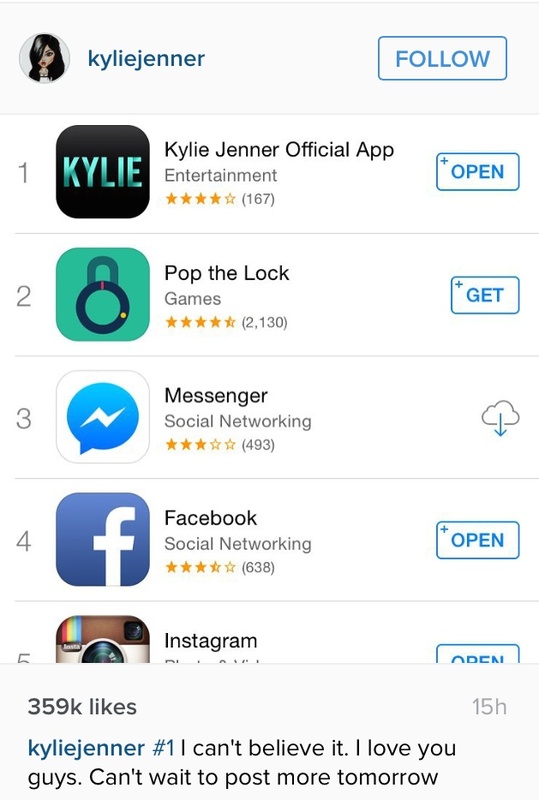 The grand unveiling of the multiple Kardashian/ Jenner apps was a difficult to miss event yesterday. Kim, Khloe, Kendall and Kylie all launched their own individual websites and apps, offering paying subscribers exclusive access to behind-the-scenes videos, tutorials, diaries and tips. However, what turned out to be far more interesting than Kim’s latest raunchy pregnancy outfit, was how well her youngest sister Kylie’s app performed. The 18-year-old quickly reached number one on the Apple App Store’s free apps chart, ahead of social media staples like Facebook, Instagram, YouTube, and Snapchat. None of her sisters even made it into the top 20. Ouch. As Kylie proves she can break the app world all by herself, here are four things we’ve learnt from her career path. Go back a year and not many people outside of the KUWTK fan clan knew who Kylie Jenner was. But fast-forward, and more than 35 million Instagram followers and a savvy Snapchat presence have made her a social media sensation. Her 18th birthday party created a social media buzz that rivalled Mrs West’s wedding, and her Instagram feed has become one of the main pillars of her success. As with any other 18-year-old, Kylie’s career aspirations aren’t set in stone. Even though she probably won’t have a high-end modeling career to the extent of big sis Kendal, she walked for Kanye West’s collaboration with Adidas during NYFW last February and features in the latest major Balmain campaign. Just because you don’t see a long term future in something, that doesn’t mean you can’t give it a try. Kylie’s obsession with make-up and beauty isn’t new, and her flawless looks have been the inspiration for countless Youtube tutorials. So it’s no surprise that her app is filled with make-up tutorials and beauty advice, which is what she is passionate about. She also announced a new lip kit that will be sold through the website later this year, making the most out of her coveted pout. According to Kim, the sisters have been working on content for their apps for over a year. Even if you’re a Kardashian/Jenner and have unlimited resources at your disposal, it takes times to do things well, and it seems that the time invested is paying off – for Kylie at least.